Alex (left) sings lead vocals in St. Beauty; Isis plays guitar. Atlanta natives Alex Belle and Isis Valentino met in 2012 while working at Poor Little Rich Girl, a now-closed vintage clothing shop in College Park. After discovering a shared taste for 1970s soul music, they formed their neo-soul and R&B duo, St. Beauty. Janelle Monáe signed them to her label, Wondaland Records, after catching one of their in-store performances. They plan to release a full-length album later this year. Favorite vintage era The 1960s and 1970s. I love the high-waisted pants, the patterns, ring tees. The music was so great: Jimi Hendrix, Janis Joplin. Style icons Diana Ross in Mahogany. She wore those crazy pieces with such confidence. Designer love Phlemuns. They have a vintage vibe I really love. First concert Lupe Fiasco at the Tabernacle when I was 15. He did a backflip on stage! Formative musical experience The first record I bought was B5’s “All I Do.” I still have a photo of me in front of a B5 poster. Musical influences Santigold. The way she performs, it’s so minimal. Beauty routine I love all natural stuff: black soap, shea butter, tea tree oil. There’s a company out of North Carolina, Good JuJu Herbal. They have a face moisturizer I love. Ideal collaborator Pharrell for music and fashion. Style icons Audrey Hepburn. You wear a black turtleneck and ballet shoes, and people feel like you’re doing something special. Designer love I’m obsessed with Missoni and Edun; I love all the color. First concert Kanye West’s Glow in the Dark tour. Beauty routine I get my hair cut by J. Sari in Sandy Springs. She also does [local soul singer] Bosco’s hair. Ideal collaborator Raphael Saadiq. He has this magic touch for updated soul. 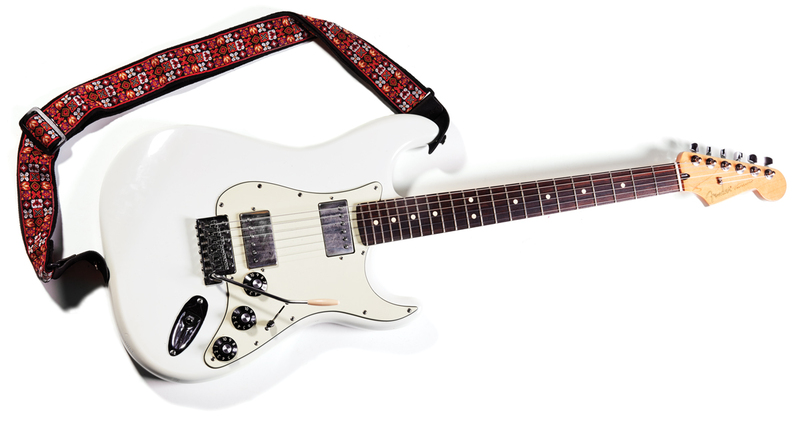 Isis’s Fender Stratocaster reminds her of the guitar Jimi Hendrix once played.